Back in the ‘80s and early ‘90s, 1-900 hotlines became a billion dollar industry. The revenue potential was first realized thanks to a 1982 SNL skit starring Eddie Murphy threatening to kill Larry the Lobster. Viewers were encouraged to dial in at a cost of 50 cents per call to either save the lobster or watch him get boiled. According to Priceonomics, AT&T was flooded with calls and returned over $200,000 in revenue that night. From that point forward, the word was out that 1-900 numbers could earn some big bucks. Prior to the widespread availability of the internet in the mid ’90s, pay-to-listen hotlines were actually a viable service. Sports fans could get the latest information on their favorite teams. Music fans could hear singles from their favorite band prior to its release. Kids could listen to recorded messages from their favorite celebrities. And it wasn’t until 1992 that the government regulated hotline content and added strict regulations to deter fraud. 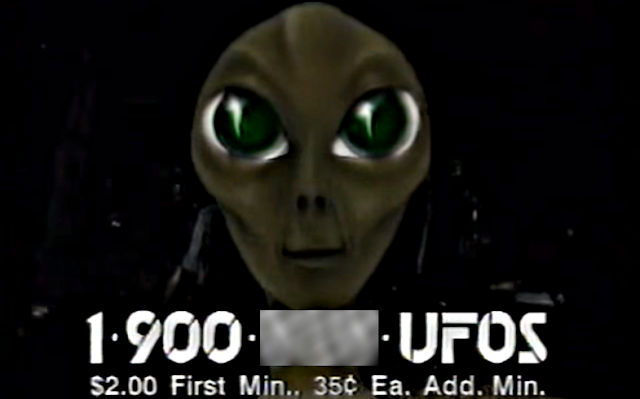 Up until that time, 1-900 hotlines could get away with offering just about anything to get kids and adults alike just by picking up their touch tone phone and dialing the magic numbers. I remember getting caught up in it myself as a kid, dialing hotlines to listen to messages from WWF wrestlers and DJ Jazzy Jeff & The Fresh Prince. But even as pre-teen, I never was tempted to dial simply based on the outrageous, exclusive information that some hotlines offered. Do you want inside information into “the biggest cover up ever?” Of course, you do! Besides, if E.T. could phone home with a Speak & Spell and a record player, how much better would a real phone connect you to outer space!! Sometimes you just need to let your emotions (and curiosity) get the best of you and have a good cry. What were these poor folks crying about? My guess is that not only were they paying $2 a minute but operators had also traced the call to their house and were currently spray painting their cat. Want to talk to ghosts and zombies that are not quite dead and happen to have a phone receiver handy? Then you probably wanted to call Creep Phone and learn how a real non-living thing can extract the heart of your bank account. Everyone wants to improve their high scores and before Nintendo Power was published in 1988, the Power Phone was probably a viable resource if you hadn't learned the Konami code yet. But there were many video game hotline commercials and apparently hiring superheroes (like this an early gig for the Ambiguously Gay Duo) was a great way for your hotline to stand out. This hotline claimed you could hear a recorded conversation of Elvis, four years after his death. Could it be real or just another Elvis impersonator getting rich from your phone bill? You be the judge. Having a great day? Tucking away some money for a rainy day? Well, here’s a way to ruin the great life choices you’ve made up to this point by paying $2 a minute to get lambasted with insults! The Present: Needs improvement. Call both the business and party hotlines at $2 a minute to get the latest mullet tips. Yeah, so maybe it was the same “secrets” that were in every grocery store tabloid, but you know those papers always misquote the source. Now, you could finally confirm that the cat fight with Tammy Faye Bakker actually happened. Of course, every kid would have loved to talk directly to Santa at Christmastime. It’s actually why we now have hands-free phone options because Santa took out a few too many chimneys with the sleigh while talking to kids on the North Pole hotline. As a game show enthusiast, I’m trying to picture how you would play Let’s Make A Deal over the phone. It’s not like you can actually see what’s behind the curtains or doors. And if you thought getting “zonked” on the TV show was bad, it must have felt even worse over the phone knowing you get some crappy prize AND a large phone bill. It sounds like this was maybe an early version of American Idol. All you had to do was call, perform your best song (in this case “For Your Eyes Only” which is a little creepy for a teenage girl), and judges determine who wins. 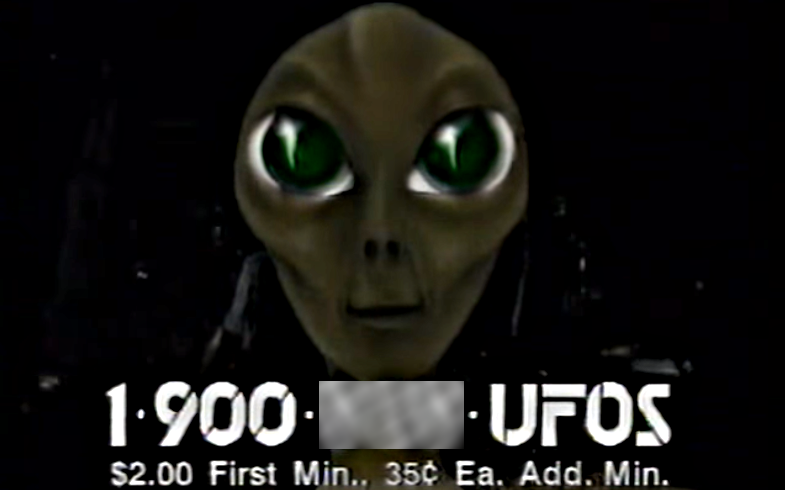 Grand prize was $1000 and an appearance on a national commercial...my guess is the latest version of this stupid hotline ad.